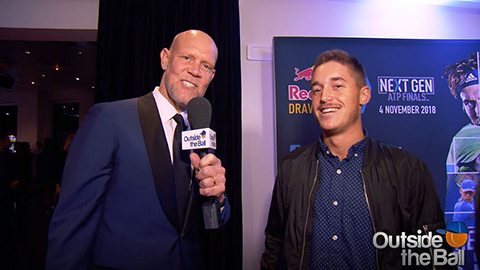 Outside the Ball touched down in Milan, Italy for the Next Gen ATP Finals and Outside the Ball correspondent Murphy Jensen was ready to party with the pros. Murphy started the night by asking the rising stars how it felt to compete in the finals. “It’s my first one, I missed it by one last year so I’m happy I made the cut this year relatively comfortably and it’s nice to be out here. ” Frances Tiafoe explained. “It’s a special moment for me and I think it’s a very good year for all of us and it’s special to be sharing the court and tournament with all of these guys.” said Jaume Munar. 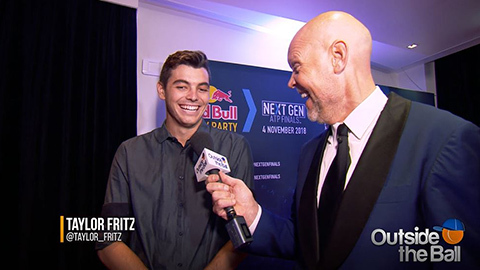 The Next Gen Finals is a unique event that showcases a quicker format and new rules. We asked the players what about the event is so attractive to the players and the fans. “The ATP did an unbelievable job trying to put us on the map, the young guys, obviously we get put in the shadows to Roger and Rafa, as we should, but they do an unbelievable job doing something new.” described Tiafoe. The finals are held in the beautiful city of Milan, where fashion may come to mind. Liam Caruana surprised Murphy Jensen when he mentioned he will be showcasing a sleeve at the event. To our correspondent’s disappointment, he wasn’t referring to a tattoo sleeve. 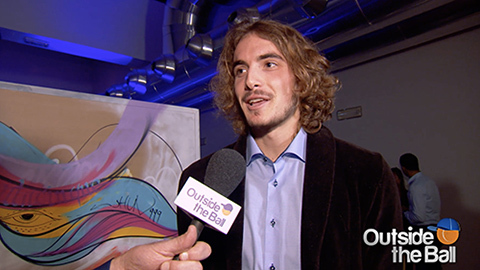 Stefanos Tsitsipas is definitely a player who has great style that is all his own and he’s bringing that to Italy. “I’m going to trim my beard, hair. I’m going to get fresh and feel like a million bucks again.” the Greek laughed. With their wild beards and classic style, the Next Gen stars are fueling up with Red Bull and ready to get down to business! Good luck, guys!